Earlier this month, onetime hit-makers Limp Bizkit dropped their big comeback record—and most of us took it as an opportunity to look back and laugh at that oft-repressed time when nearly every rock band had a deejay. It goes without saying that the early 2000s were a bleak time for the music industry, and the few bands that were able to come out on the other side managed to do so through careful and well-timed reinvention. 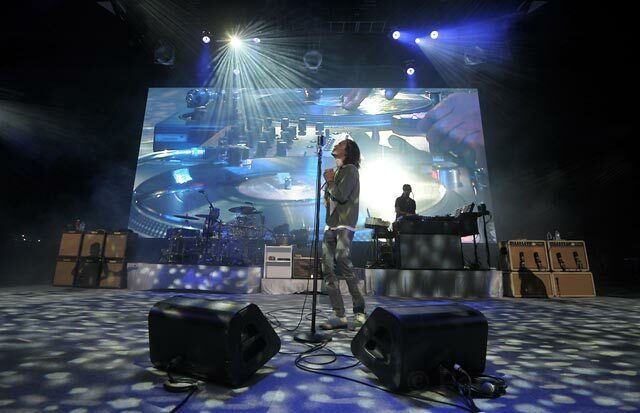 On Friday night, Incubus, Los Angeles’ favorite stoner rockers turned surfer rockers turned artful rockers, took to the stage at a sold-out Santa Barbara Bowl in support of their latest—and seventh—LP, If Not Now, When? For their nearly two-hour-long set, the five-piece barreled through tracks from their hip-hop-infused, funk-lite roots (“Consequence,” “When It Comes”), dabbled in the nu-folk balladry that propelled them to mainstream success (“Drive,” “Wish You Were Here”), and played a smattering of hit-or-miss fresh cuts (“Adolescents,” “In the Company of Wolves”). But what has held and continues to hold Incubus together is not necessarily their songwriting abilities. In frontman Brandon Boyd, they have one of the richest and most dynamic voices in modern rock, capable of bending between belt and growl without so much as a waver. And on older hits like “Pardon Me” and newer singles like “Anna Molly” and “A Crow Left of the Murder,” Boyd’s ability to meld forceful rock with rich melody (and bassist Ben Kenney’s baritone croon) is strikingly clear, and reason enough to embrace the band for their ability to survive the storm.